« Has Machine Translation Come of Age? Since for the vast majority of people their web journeys … start with a search engine rather than a direct visit we should think of Google as the homepage and we should also feed Google, Bing and other search engines nice friendly urls. These discussions are, of course, equally valid for university web sites. Since the importance of ensuring that content can be easily found using search engines is true for content hosted on University web site, last year the JISC funded the Linked You project. The project provided a series of recommendations to enhance access to resources based on the design of URIs for resources hosted on institutional web site. But such advice covers only a part of the picture. In addition to what the report describes as implementing an “improved underlying URI structure” links to institutional web sites also play an important role. The 2011 Overall Ranking Algorithm chart provided by SEOMoz (Source: SEOmoz Ranking Factors) highlights the importance of links to a web site for search engine optimisation. As described on their page on How Search Engines Work the top factor which affects the visibility of web resources to search engine suggested in the Yahoo guidelines is “The number of other sites linking to it“. The SEOMoz web site goes on to describe how “Through links, engines analyze the popularity of a site & page based on the number and popularity of pages linking to them, as well as metrics like trust, spam, and authority“. An analysis of links from authoritative sites to institutional web sites will therefore help us to gain a better understanding of the extent and profile of links from key resources and may help to inform policies and practices for helping to maximise the benefits which may be gained by implementing appropriate linking strategies. As described in a recent post which provided an SEO Analysis of UK Russell Group University Home Pages Using Blekko registered users of the Blekko search engine can access a range of data relevant to SEO for web sites. The following table provides a summary of one set of data: the top three highest ranked web sites which have links to the twenty Russell Group university web sites. The following table summarise the services which are listed in the above table. Note that the data is collected used the Domain SEO Inbound Links search option which has the format “http://foo.ac.uk/ /domainlinks“. From this table we have evidence of the most highly ranked web sites which provide links to a selection of university web sites. As described above such authoritative web sites can have a significant role to play in enhancing the visibility of web sites in search engine rankings. The question then is how can this evidence help to inform policy and practice? Twitter would therefore appear to provide no SEO benefits. The case for Wikipedia is, however, very different, as indexing robots are permitted to index the content of Wikipedia pages, including links contained in Wikipedia articles. As can be seen from the above table all Russell group universities apart the University of Leeds have links from Wikipedia amongst the top three highest ranked web sites which provide inbound links (and Wikipedia is the fourth highest ranked web site which provides 371 inbound links to the University of Leeds). There are therefore over 6,000 links from Wikipedia to the twenty Russell Group universities with UCL having over 1,000 inbound links. One strategy to enhance an institution’s ‘Google juice‘ would therefore appear to be to embed links to the institutional web site from Wikipedia articles. However contributions to Wikipedia articles should be provided from a Neutral Point of View and should be factual and verifiable. In order to avoid adding material with a vested interest, there would be advantages in encouraging members of the university to contribute to articles even if, and perhaps especially if, links are made to other institutions. 16 -24 year olds are heavy users of social networks, so you’d expect universities to have been ‘socially active’ by generating and posting interesting, engaging content (articles, images, video and audio) on their own websites, and then sharing it on social networks. The survey, which was based on data harvested by the company and not made publicly available, suggested that Facebook generated over 80% of links from social media sites to Russell Group university web sites. 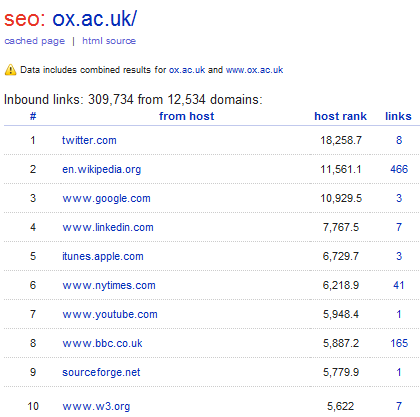 It was interesting to note that the data provided in the Blekko analysis did not include links from Facebook despite that fact that, as illustrated in the accompanying image for the top incoming links for the http://www.ox.ac.uk domain, the highest ranked domains tend to be social media sites. The Blekko findings for facebook.com show that the sites has a ranking of 23,420.3 and has 317,167,273 pages. It is therefore unclear as to why according to Blekko Facebook is not highlighted as a significant site with links to Russell Group universities. Note that as described in a recent post on SEO Analysis of UK Russell Group University Home Pages Using Blekko, significantly different results can be obtained for analyses using variants of the institutional domain name, as illustrated below. As can be seen the official version of the domain name can have significantly fewer links than the variant (1 versus 216 links from Wikipedia in the case of http://www.liverpool.ac.uk and http://www.liv.ac.uk). Another suggestion, therefore, which may help maximise SEO benefits would be to ensure that links from highly ranked web sites, such as Wikipedia, link to a definitive version of the domain name. This article began by describing how “Through links, engines analyze the popularity of a site & page based on the number and popularity of pages linking to them, as well as metrics like trust, spam, and authority“. The survey has identified the most highly ranked web sites which contain links to university web sites. It is suggested that in addition to implementing the recommendations provided by the Linked You project, related to the URI design of an institutional web site, an institution’s social media strategy should address ways in which links to the institutional web site can be provided in an ethical way. In addition, institutions should seek to ensure that links to their web sites are not fragmented across variants of the web site’s domain name. Paradata: As described in a post on Paradata for Online Surveys blog posts which contain live links to data will include a summary of the survey environment in order to help ensure that survey findings are reproducible, with information on potentially misleading information being highlighted. This survey was initially carried out on 8 January 2012 initially using Chrome on a Windows 7 PC and was completed using Safari on an Apple Macintosh. In addition the figures in Tables 1, 2 and 3 were rechecked on 1 February 2012 and any changed values were updated. It was noted that differing results were obtained if variants of the domain name (e.g. http://www.cardiff.ac.uk and http://www.cf.uk and www3.warwick.ac.uk and http://www.warwick.uk) and entry point URLs were used (e.g. http://www2.lse.ac.uk/ and http://www2.lse.ac.uk/home.aspx). This has been documented above. This entry was posted on 1 Feb 2012 at 9:30 am	and is filed under Evidence. You can follow any responses to this entry through the RSS 2.0 feed. You can leave a response, or trackback from your own site.